Home » Eye Care Services » Dry Eyes & Wet Teary Eyes » What is Dry Eye? How can we treat it? Dry eye syndrome (DES) and Ocular Surface Disease (OSD) are terms that describe a range of conditions that can make people miserable. The cause of dry eye can be varied and can range from diseases that cause the eye to become dry, side effects of medication that cause eyes to become dry, excessive computer and other near work, soft contact lens wear, and menopause. Most cases of dry eyes can be improved significantly with the right treatment. Dry eye can also cause blurred vision and difficulty with night driving. A special examination enables us to determine the cause and how severe the problem is. We treat the problem starting with the most simple and then progressing from there. There are some 10 different treatments that increase in complexity. You could say we take a tiered (pronounced ‘teared’) approach to dry eye. At times we must combine various treatments. What are the signs and symptoms of dry eyes? The doctor and patient need to work together work as a team. We can make recommendations but you must do your part to help you solve your problem. Over-the-counter tear supplements, sometimes called Artificial Tears, are a starting point, but they may yield only limited improvement. This approach may work for mild cases of dry eyes caused by computer use, reading, schoolwork and other situation. There are many different over the counter eye drops and this can be confusing to patients. Which drops should I take? People often try one and then proceed to different ones. A logical sequential approach often works better than a shot-gun approach. Some products that are heavily advertised are usually used first. Thinner ones may only last a short while and thicker ones may make you blurry. At times people may need to use these eye drops several times a day. People who use the thicker drops may then find it is blurry when driving or working on the computer. One brand might work better for aqueous-deficiency dry eyes, while another brand may be more effective for an evaporative dry eye condition. Mixing and matching different eye drops usually leads to a hodgepodge approach and little relief. What else can I do for my dry or very wet eye? My eye is not dry. It tears all of the time. What can I do? It can be confusing, but a dry eye and a very wet eye often have the same problem at their root. Some people may need warm compress, nutritional supplements, or lid scrubs. At times prescription medication is needed to addresses the inflammation to help your body produce more natural tears to keep your eyes moist, comfortable and healthy. Restasis, for example, is a prescribed medication whose benefits come only after using the medication for several weeks. Some people find their eyes sting when they insert the medication. Inflammation is often the reason for dry eyes, and this is the reason for the redness and burning feeling. Addressing the inflammation is often the best way to address the underlying problem. Merely using over the counter tear supplements often do not solve the problem. Prescribed steroid eye drop medication may be needed to better manage the underlying inflammation associated with dry eyes. Steroids are not without risk, however, and they can be used successfully for short periods. 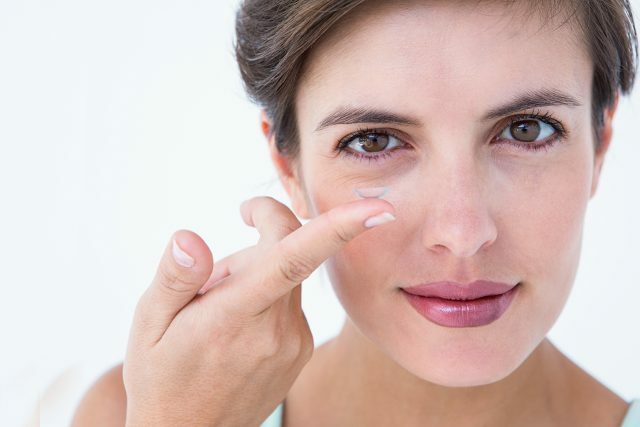 Lacrisert (Bausch + Lomb) is about the size of a grain of rice and is a sterile, slow-release lubricant placed in the sack between the lower eyelid. It slowly melts and produces a moisturizing effect that lasts all day. It relieves many of the symptoms of dry eye. Temporary Punctal Plugs made from collagen can be inserted into the tear ducts. They dissolve over 7-10 days and give temporary relief. If someone gets relief from the temporary plugs, silicone punctual plugs can then be inserted. Rarely do they need to be removed, but they can be if need be. These plugs help maintain the tears in the eyes rather than draining into the nose. 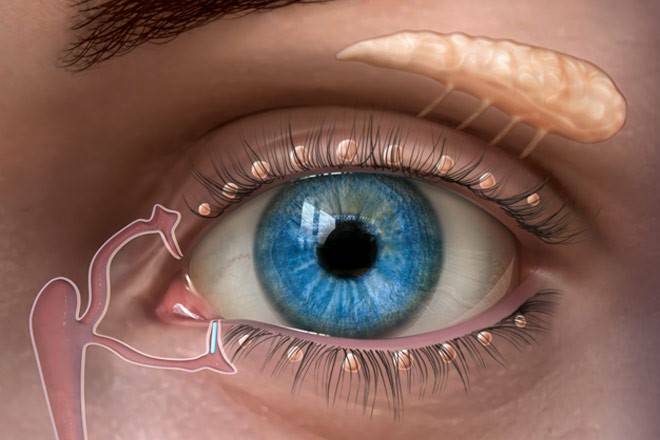 The drawing shows the lacrimal glands and tears ducts, and in the drawing, you can see a temporary lacrimal plug (or punctual plug) called a collagen plug, that has been inserted into the lower tear duct to keep the eye's moisture from draining away too quickly. A punctual plug is a small, sterile device that is inserted into one of the small openings (puncta) of tear drainage ducts that are located in the inner corner of the upper and lower eyelids. We usually begin with a temporary, dissolvable collagen plug. A more permanent plug can then be inserted. Even the permanent plugs are removable if then need to be. The meibomian glands produce the oil that lubricates the eye. They are located along the edge of the eyelids. If the glands do not produce the oil because they are plugged up, that is called meibomian gland dysfunction (MGD). We must first remove the obstruction by using warm compresses and then special forceps to squeeze the clogged contents (hardened meibum and possibly other substances) from the glands. A starting point to help open clogged meibomian glands to treat dry eyes is to apply warm compresses to the closed eyelids to soften the hardened meibum and follow that by lid scrubs. To be effective, this must be repeated several times a day. Nutritional supplements that contain Omega 3 fatty acids can decrease dry eye symptoms and help your body create a better quality tear. When we use a computer, read, or another handheld digital device, we tend to blink less than we do otherwise. This can make the symptoms of the dry eye even worse, especially if someone works in a dry office. Eyeliner and other eye makeup can clog the openings of the meibomian glands at the base of the eyelashes, leading to meibomian gland dysfunction and evaporative dry eye. If you use eyeliner, apply it to the outside of the lashes. If you apply it to the edge of the lashes, it will clog up the glands. Many medications including medication for High Blood pressure, antihistamines, antidepressants, birth control pills, allergy medication, and others can cause your eyes to become dry. Menopause can bring on dry eye symptoms. All soft lenses lose water during the day. If you wear contact lenses, consider either a daily disposable or scleral lenses. The benefit of scleral lenses is they create a reservoir of tears and often these special lenses are the answer to dry eye treatment. If over-the-counter eye drops have not given you relief, there are specific eye drops that usually work much better. There is a tear chemistry change and there are some medications specifically made for women, and those made specifically for men.